Certainly, there is plenty of bling and precious metal flirting with our eyes these days... So many catalogues filled with sparkly close ups and pictures of happy moms holding babies, twirling around, wearing the objects of desire, a.k.a. jewelry. Great!! ...It's always nice to imagine ourselves looking pretty, all dressed up with the heels, the full skirt, the jewelry and the baby, dancing around... But, in seconds, we come back to reality and realize that the imitation of that perfect picture in the catalogue, might end up landing us on the floor with a twisted ankle, looking a little less than glamorous. That's the moment when we start thinking of jewelry that identifies us, and reallistically, matches our everyday life. Something tasteful, artistic, meaningful... Yes, meaningful is an important aspect for a Mother's Day present. Don't you think so? I do and that is the reason why I liked Alice Roche's "Legacy" necklaces so much. The collection was designed with the special bond between mother and child in mind, representing the three qualities in a child that moms wish for, as they watch their little ones grow. Alice Roche, a jewelry designer and architect from San Francisco, reached to her Facebook community and asked. After getting so many suggestions, she picked the three winners... 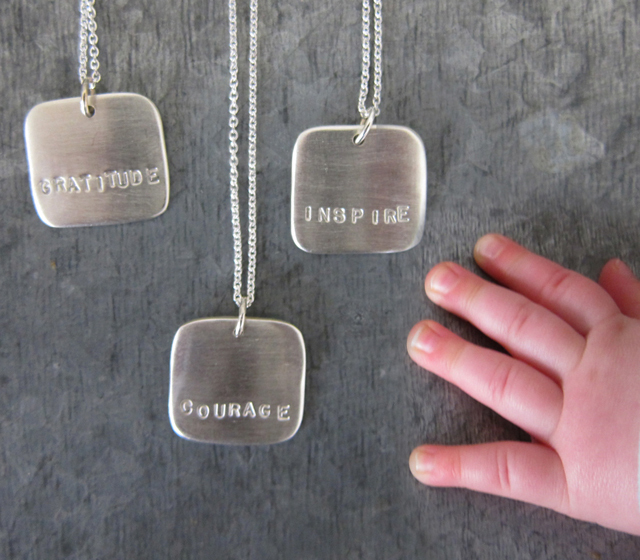 Courage, Inspire and Gratitude have now taken shape in the form of these hand stamped, sterling silver necklaces. 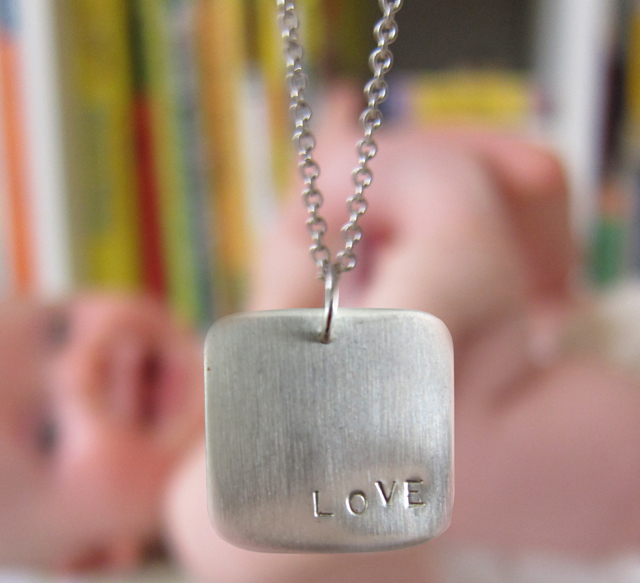 Simple, yet so stylish, the collection also includes the "Love" and "XO" versions, both equally appropriate for Mom's Day. Alice Roche Jewelry available here. New York City is magical in many ways. Whether you live here or visit it for a few days, there is always something special, unique for everyone that makes you remember it forever. The diversity, the fast pace, the constant contrast, I don't know which one captivates me more, but one thing that always fascinates me about it, is the many possibilities to find peace and quiet in the middle of chaos. 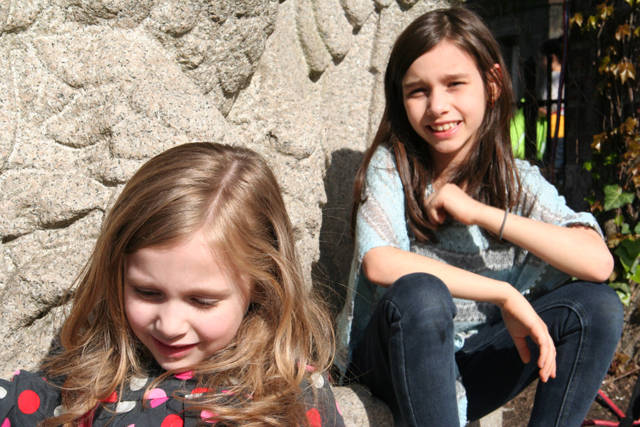 Some days ago, I took my girls to the Central Park Zoo and even though it was packed with people of all ages, kids, babies, strollers, bumping backpacks and diaper bags, we were able to enjoy a sense of distance from the craziness and relax. 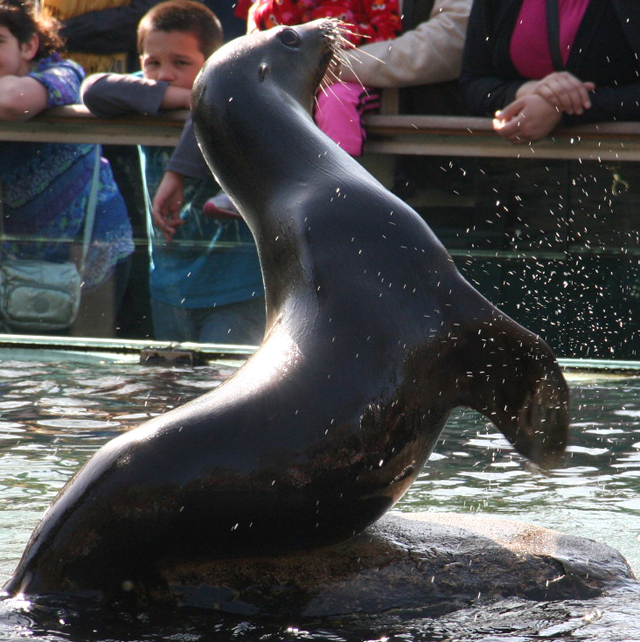 Zoo and the City... Inside, we could still hear the far away hunking and ambulance sirens. We could still see the fancy roofs of the buildings on Fifth Avenue to remind us where we were. 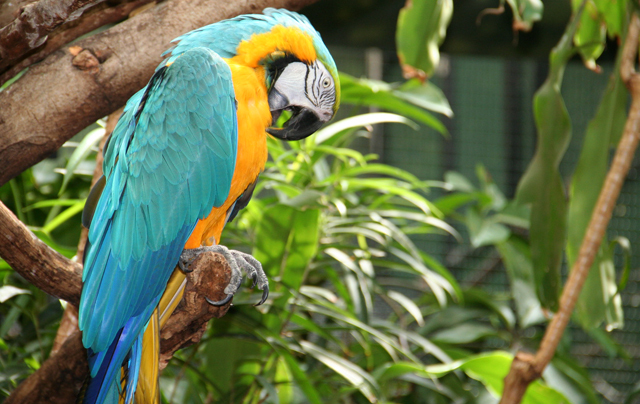 But, behind the zoo's tall walls and gates, we were protected from mayhem, almost in a different dimension, surrounded by the candor of nature, subtle animal sounds and a silent explosion of colors... Definitely, a nice break!! 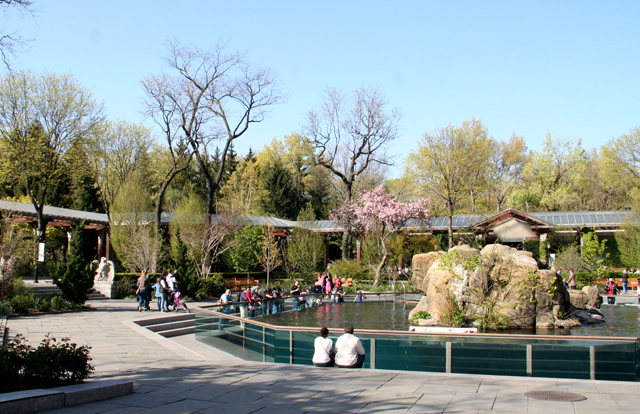 Central Park Zoo, for details and directions, click here. Well, it seems like we are finally done with April's festivities, Easter, Passover, Earth Day... pheeew!! But, don't relax too much, because it's time to start getting ready for Mother's Day and baby showers... Ahhh!! Spring baby showers. They abound this time of the year and you know what that means... right?? Gifts, gifts, gifts!! Suggestions? Yes, of course, we have many, and we are going to start providing them, right now. "For Mom/For Baby" is our new gift list showcasing beautiful things that are visually related, by colors, patterns, shapes or style; one for mom and one for baby. So, stay tuned and don't miss a post. We might post the right gift you just needed to get. 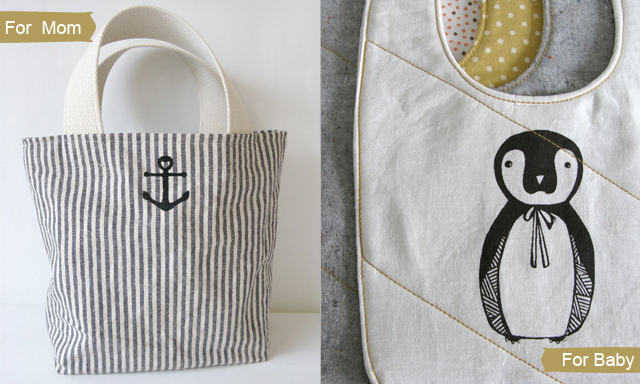 Today, a Lunch Tote for mom and a Penguin Bib for baby from Down Home Amy, an Etsy shop and design studio from Vancouver, Canada. Both, tote and bib are made with organic cotton, and the original illustrations are screen printed using water based, non-toxic ink... We love the delicate use of color in all of Amy's creations. Black, white, gray and a spec of mustard... Modern, simple, tasteful!! Down Home Amy available here. 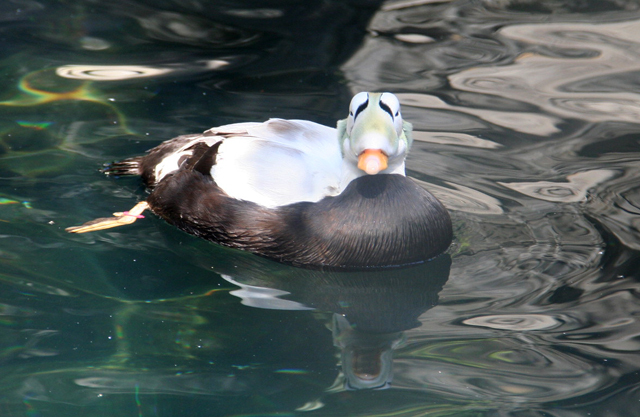 Yesterday, our Earth Day turned out to be a lot different from what we had in mind. 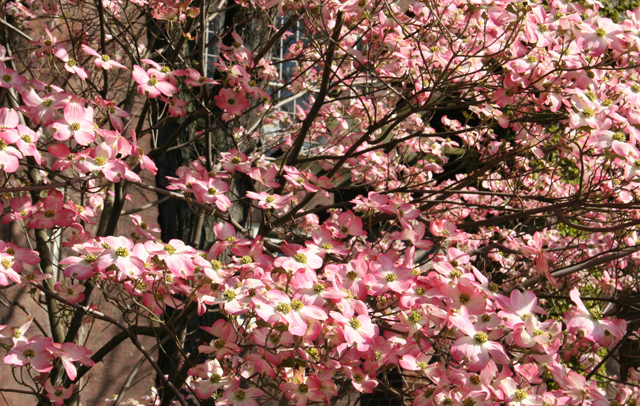 On Sunday, the wonderful spring-summer weather we enjoyed previously, disappeared. 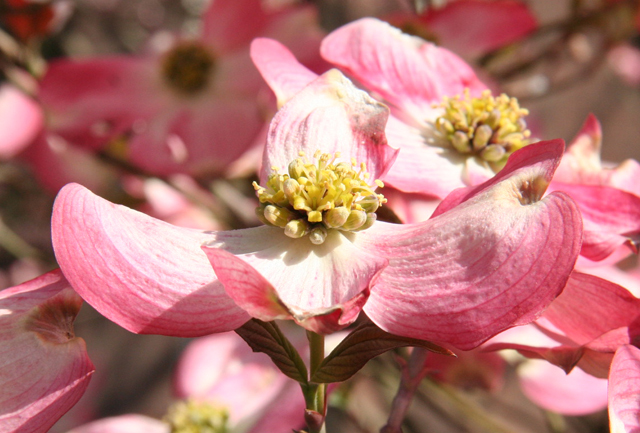 Instead, we got April showers, strong winds and cold temperatures. Having a picnic at a park, planting flowers and hiking became a brunch in the kitchen, crafts indoor and climbing onto bed to watch a movie. Not bad at all for me. As an adult, I can always appreciate a quiet, peaceful Sunday at home. However Zoe, my five year/old daughter insisted on not calling Earth Day off. Instead, she came around with this little poster in her hands, to remind me that there is a lot we can do together, outdoors or indoors, to show respect and care for our planet, not only on Earth Day, but everyday. Zoe, as well as my older daughter Naomi, now nine years old, went to the same environmentalist Pre-K program at the Hudson Highlands Nature Museum in New York. I have to say, it is amazing the amount of knowledge a toddler three-four years old can acquire by experiencing nature "hands-on", and the respect for the environment they can develop at such an early age. Maybe, some other day I'll write a post about this school. 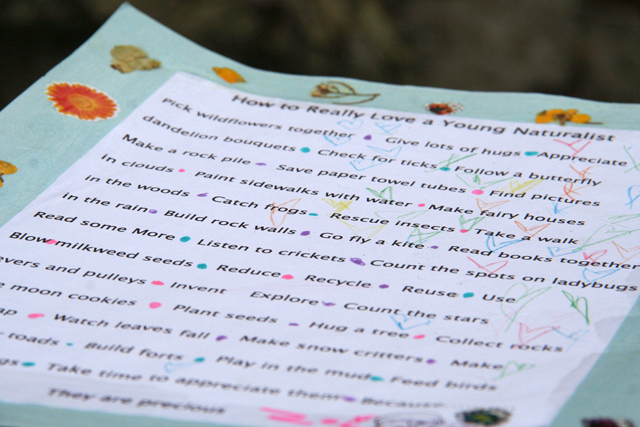 What I want to share now is this beautiful manifesto that the children made at the end of their last pre-school year to give to their parents, along with their diploma on graduation day. Hudson Highland Nature Museum, more info available here. ...Needless to say anything else!! 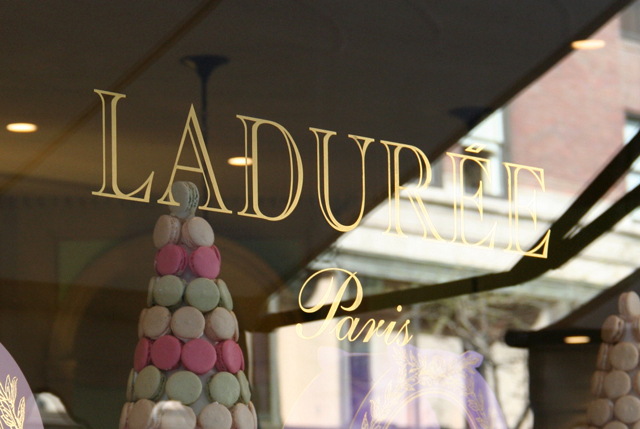 The macarons from Maison Laduree in NYC are nothing but a piece of heaven on Earth. I had a visit to this French palace of perfection on my schedule for months, and finally made it there. Not to my surprise, the amount of people waiting on line to be rewarded with the scrumptious delicacy, took the whole floor of the "petit" store. Patiently, my two girls and I stood up, enjoying some good fifteen minutes of observation. 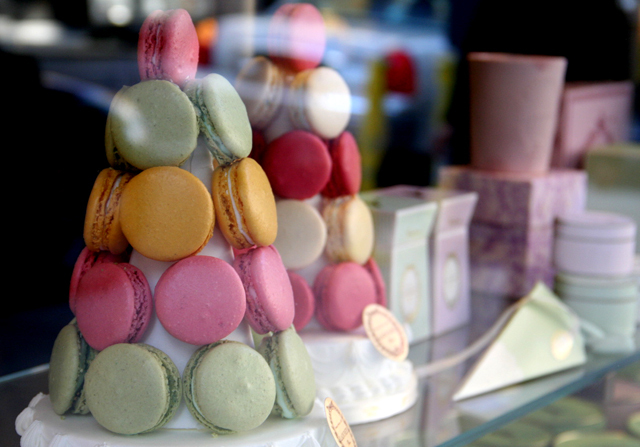 Laduree's macarons have taken over this chic block of Madison Avenue. Forget about designer clothes and fancy shoes. Right there, on the sidewalk, there was a good amount of turists and locals streaming on their IPhones and to the world, the pictures of their faces devouring the colorful cookies. Not to mention the black limos parked right in front, while uniformed drivers, obediently joined the line inside. Our turn to order came. I decided to let everyone choose a couple of flavors and then share them all... So, we ended up doing the same everyone else was doing... Why waiting any longer?? Why taking these macarons anywhere else? We had to eat them immediately, right there, on the sidewalk. At that moment, it felt like a chorus of angels was around... I could hear aaawwwhhhh!!! accompanying every single bite. Really delicious. No wonder why Maison Laduree has been around for 150 years. Now, we are so lucky to have them in New York City. Addictive!! A wonderful mix between a sponge cake and a slightly crunchy cookie with the right amount of almond in the dough and the softest, creamiest ganache between the two shells. No flavor was disappointing. They were all delicious, but we were more surprised with the exotic ones, like cherry blossom, blackcurrant violet, rose and raspberry. On the more traditional side chocolate, vanilla and coffee were out of this world. 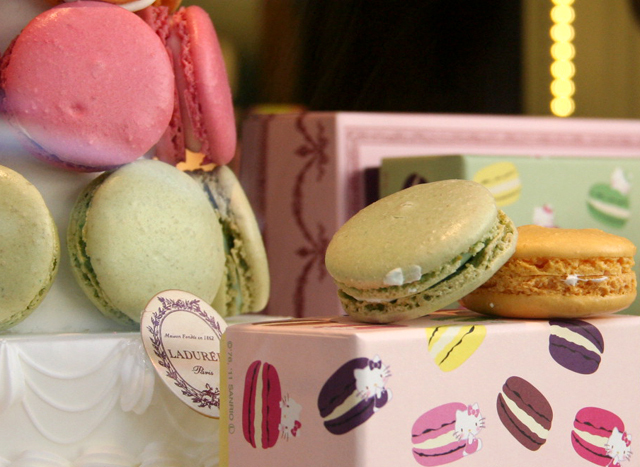 Whether you live in NYC or are coming to visit, do not miss Maison Laduree and its macarons. A wonderful treat. I just can't wait to go back... Are you crazy about a dessert place too? Where is it? Share with us, we would love to know. Maison Laduree, more details here. The incorporation of gray tones to modern nurseries is a new trend spreading fast. Just a couple of days ago in a previous post, we talked about the growing amount of accessories in different shades of gray to help complete the decor of a nursery or the kids room. Now, we just got an e-mail from the makers of Muu Design announcing the launch of their new collection for 2012... We are loving it already!! Have you heard of Muu Design? We are fans of their furniture. Modern, simple, stylish and enviromentally conscious. How can it not be a favorite? All of their products are made in the USA with locally sourced hardwood and a sense of long term durability. What starts as crib, may be turned into a toddler bed by adding the "Toddler Conversion Kit". The same crib may also be passed to the next baby in the family by using the interchangeable "Muu Pannels", each one with a different design, color, and even your own child's name... New baby, new room, same furniture!! This new line for 2012 is an addition to the existing Ray Collection, which is manufactured from maple wood and available in white and hazelnut color. 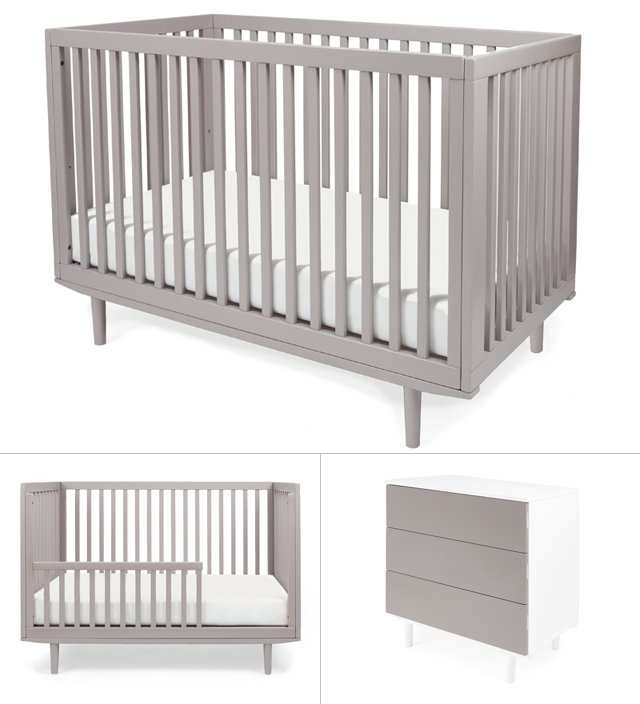 The new version for this season includes the Ray Crib, Dresser and Toddler Conversion Kit in gray, honey and coffee colors. Muu Design products are finished with non-toxic lacquer and fully certified for the USA and Canada... yay!! Walking the streets of New York City these days, may take longer than ever, especially with a camera in your hand. No, not because of the arsenal of people walking in all directions and blocking your way, but just because of the explosion of colors in every corner. One must stop everywhere, admire, drool and take pictures. 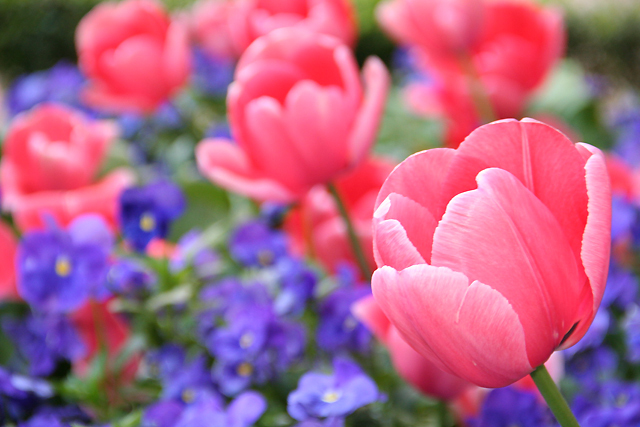 Spring is in full force around here and the sidewalks are carpeted with flowers in the most gorgeous arrangements. 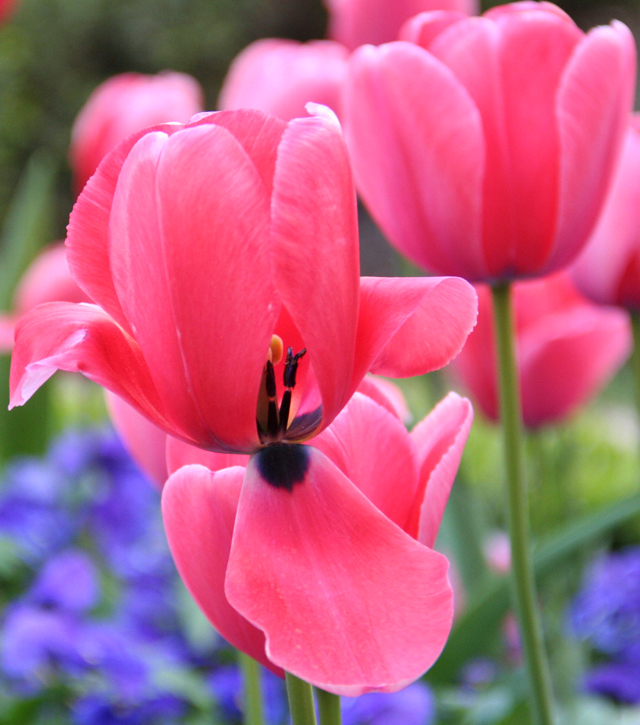 It's sad to think that it will only last for such a short time and great to know that photography can keep these tulips alive forever. Eye candy... 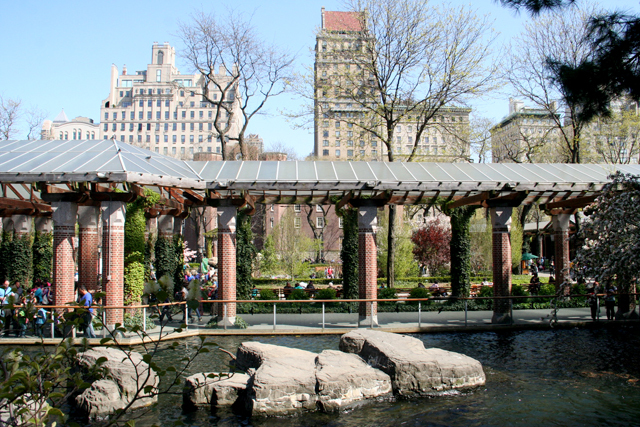 The garden at the Frick Collection Museum in NYC's Upper East Side... Spectacular!! ...Enjoy it!! Frick Collection Museum, more details here. No doubt, the chevron pattern is having a moment of stardom in fashion these days. 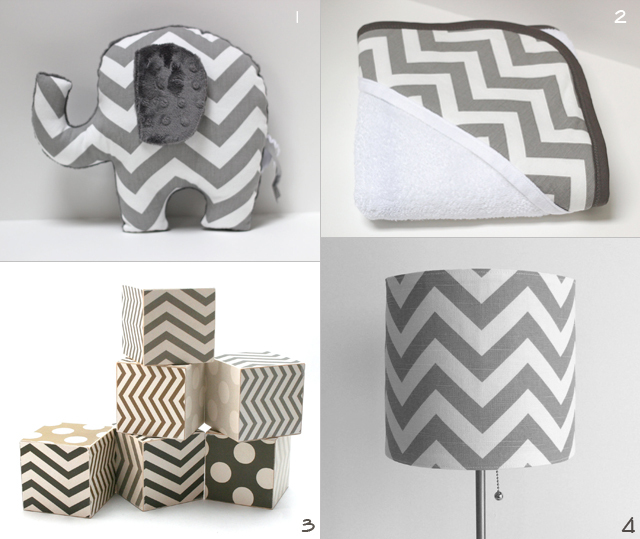 The zig zag print has taken over the world of home decor and accessories, and we are fascinated with the way it looks in gray and white, incorporated to baby nurseries and kids rooms. Modern, sophisticated, simple. Years ago surely, we wouldn't even think of a baby's room in such dark or neutral tones, but right now with the boom of modern styles and clean lines, the combination of gray, white and their many shades is just perfect... and if you just have to have something pink or something blue, go right ahead, add a few accents in those colors. They will look beautiful, so delicate. 1.- Chevron Rug available here. 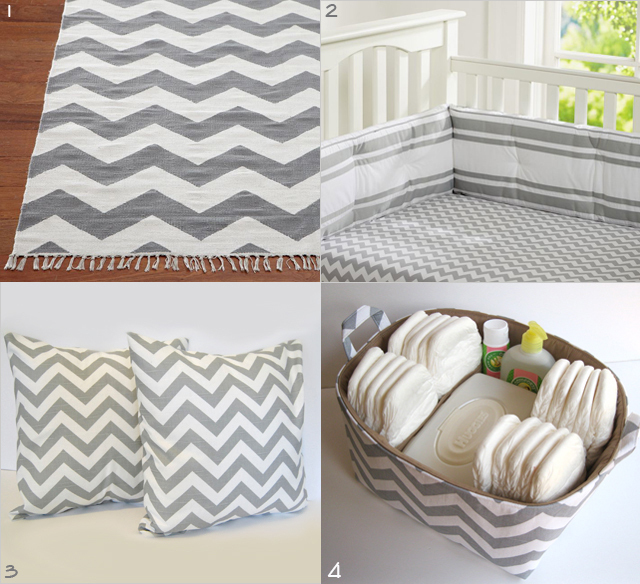 2.- Chevron Stripe Crib Sheeting available here . 3.- Throw Pillow Gray Chevron Covers available here. 4.- Diaper Caddy Storage Container available here. 1.- Chevron Elephant Nursery Pillow available here. 2.- Chevron Hooded Baby Towel available here. 3.- Chevron and Polka Dots Jumbo Wooden Blocks available here. 4.- Gray Chevron Lampshade Cover available here. That's it!! ...Hope we helped make up your mind. Deciding on baby's nursery style isn't an easy job; actually a very time consuming one. But for now, take a break, have a nice lemonade, elevate your feet and enjoy the rest of your pregnancy.... Any thoughts or questions?? Share with us. We'll be glad to answer.